How to Deal with Highly Tannic Wines — EverWonderWine? Last time we learned that some red wines can make your mouth feel dry due to the natural tannin in the wine that comes from the grape’s skin, seeds and stems. But, if you don’t care for highly tannic wines, there are some things you can do. The tannins in a red wine will ‘soften’ with age. A young wine may be highly tannic but after several years of aging, the tannins will naturally become less harsh. So, aging is one option. But, a lot of people don’t buy wines to stick away. They want to drink them now. So, there are other options if you pull the cork and realize the wine is a bit too tannic. One option is to expose the wine to air. And, just pulling the cork and letting the opened bottle sit for a while isn’t sufficient. You’ll need to decant the wine. And you don’t need to have a fancy crystal decanter to do this. Really, any vessel will work. But, the key is to allow the wine to get as much exposure to air as possible. That’s why decanters, such as the one shown in the image, are large and have wide bottoms. 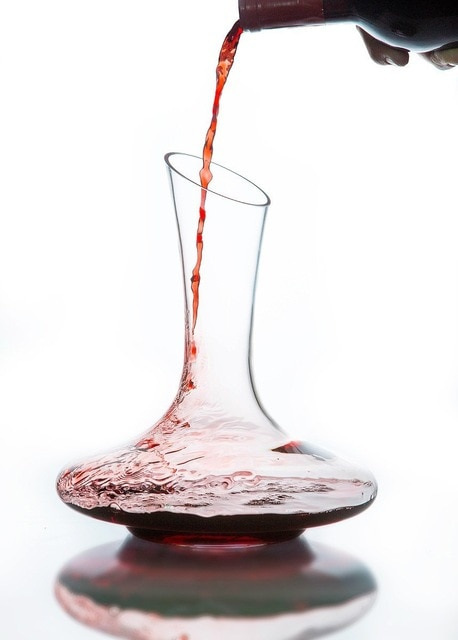 Once an entire bottle of wine is poured into this type of decanter, it only fills the base. This gives the wine a large surface area that is exposed to air. For really tannic wines, they may need one to two hours in the decanter before they begin to soften. But remember, a decanter won’t turn a bad wine into a good one. It will just take a good wine and soften it up a bit. Another method of helping soften harsh tannins is by aerating the wine. And this starts by just pouring the wine from the bottle to a decanter. Or, there are plenty of aerators that can be purchased that immediately mix air with the wine as it is poured whether directly into the wine glass or into a decanter. Finally, if you are dealing with a highly tannic wine, pairing it with fatty or creamy foods will really help. That’s why wine and cheese work so well together. Just as pairing a nice steak is a natural with red wine. So, don’t let that dry-mouth, astringent sensation scare you away from red wines. They can be some of the best there are. Cheers!